BRYAN EATON/Staff photo. 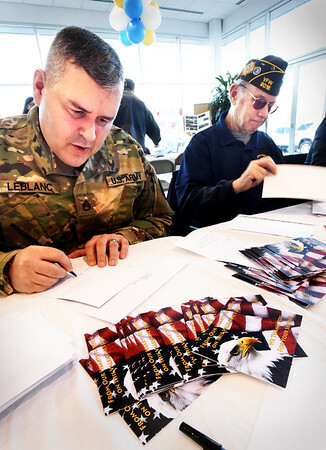 Area emergency personnel, politicians, community members, active and retired military converged at Amesbury Chevrolet to write Valentine cards for area veterans who live at home and those who are in VA hospitals, part of the Heart to Heart program. Writing cards for veterans who live at home are reserve US Army Ssgt. Joseph LeBlance of Amesbury and retired US Navy veteran Hank Cross of Merrimac. School children in are towns created the cards that are to be delivered to the VA Hospitals in Massachusetts.